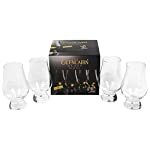 Home » Why Are Glencairn Whiskey Glasses So Popular? Whisky experts often say that the type of container you drink whisky from enhances the overall feel and taste of the drink. We feel that premium whisky is always meant to be consumed in a very sophisticated manner (well…not always…sometimes we get a bit out of hand) and if you are hosting an event or have visitors, you should help your guests feel truly valued and comfortable by offering them a whiskey in a special glass. One of the most popular types of whiskey glasses that the finest bars and breweries use to serve neat drinks is the Glencairn whiskey glass. Here are a few reasons why the Glencairn whiskey glasses are so popular and different than the other glasses. The unique shape of the glass is one of the major reasons why it is so popular. The wide orifice of the glass makes it easy for the aroma to escape the glass and allow for a complete aromatic experience. The avid whiskey drinkers often “taste” the drink even before taking a sip, by smelling it first. It is said that 90% of the taste experience is actually the aroma…so why wouldn’t we want the best aroma experience! The shape, coupled with the crystal clear transparent glass surface also accentuates the rich colour of the drink that makes it feel even more premium than before. The colour and aroma of the drink are almost as important as the taste and the texture of the drink. Some experts in the world can look at the colour of the drink to easily identify its make as well as its age in an instant. The Glencairn whiskey glasses celebrate the beautiful colour of the drink and help you enjoy it the way that it is intended to. 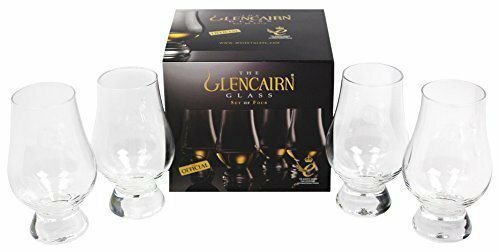 The Glencairn whiskey glasses have a flat and weighted bottom that give it a luxurious and heavy feel in the hand. The flat bottom helps the glass make a firm hold on the coaster without posing the risk of getting knocked over. The Glencairn whiskey glasses are made of pure silicon. They do not have any kind of lead content to make sure that the whiskey does not react with it. Another reason we often recommend the Glencairn whiskey glasses because they have a thick glass lining and a smooth texture. This type of manufacturing limits the accumulation of condensation drops while you enjoy the pristine malt whisky neat (or maybe with a tiny amount of ice or water). On the topic of manufacturing, these cut crystal Glencairn whiskey glasses are one of our all time favourites. Just beautiful craftsmanship.